My husband has told me on multiple occasions when I'm acting crazy. We all do it, we overreact and our emotions take over. And for ladies, the crazy level goes up a notch or two a few days out of the month. Am I right, ladies and gents? This past fall and winter, I stayed busy doing household chores, caring for my husband and shuttling him to physical therapy and other appointments four days a week. It felt like a full time job. To top it off, it rained constantly. All of the gloominess, stress and hormones got to me and I wasn't in the mood, nor was I motivated to do anything productive at the end of the day. 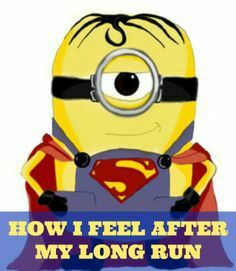 I would consider it a good day if I managed to go for a quick run. But, to be honest, most nights, it was 10pm by the time I realized I should shower and do it all over again the next day. Nine weeks ago, the never-ending appointments came to a halt, along with the stress of constantly running here and there. But my hormones still ran wild several days a month. So one evening, when I started a rant over something stupid, my husband looked at me and said: "Why don't you go burn off some crazy?" So I took his advice and went for a run. Today, marks eight weeks and I look forward to pushing the "begin run" button on my phone. I have literally made it a habit -- a healthy one, but none the less a habit. The added bonus is my clothes fit better, my energy has increased and burning off my CrAzY isn't half bad either. Pretty darn obvious which day I burned off more crazy, isn't it? What's your healthy 'habit' to burn off your crazy? *The opinions in this blog are my own and I am not paid to endorse any of the above mentioned apps.